Give the gift of choice. 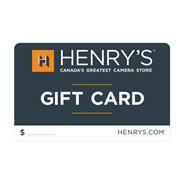 Henry's Gift Cards offer the perfect solution to your gift-giving challenges. Your family and friends can redeem the gift cards at any of our locations or online.